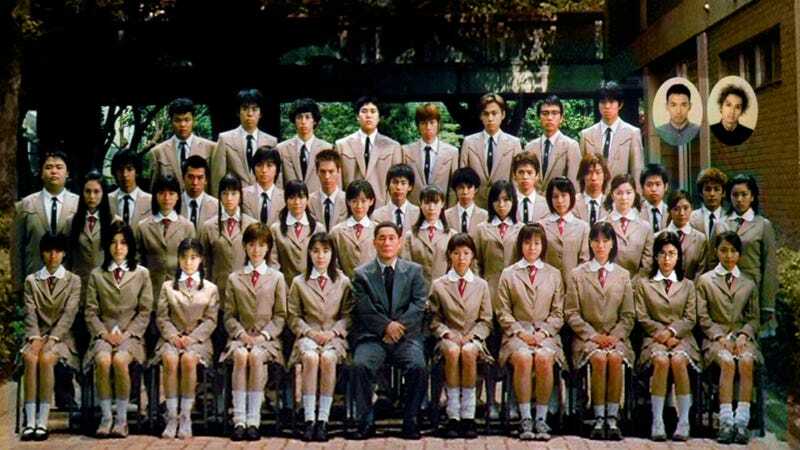 Battle Royale, the manga and the film, follows a high school class put in a deadly game of kill or be killed. Due to its violent subject matter, no American distributor would initially touch the 2000 film, especially with the school shootings happening at the time. But in the wake of The Hunger Games, there's been in interest in Battle Royale. Last summer, The CW television network seemed keen on bringing BR to American TV as a new series. According to Entertainment Weekly, the CW's president Mark Pedowitz previously said he'd "love" to do a television version and made a phone call to inquire about Battle Royale's rights; however, this weekend, he nixed those plans. "We were not able to do anything," said Pedowitz. "We are not planning to do anything with Battle Royale... nothing occurred... there's nothing to talk about... nothing happened." Pedowitz also apparently stressed that he was interested in doing Battle Royale prior to the recent mass shootings. So, when Battle Royale came out, it couldn't get an American release because of school shootings. And then, the Hollywood film version was shelved because of the Virginia Tech shooting. Now, it won't be turned into a TV series, probably also because of the recent tragic school shootings. Regardless of what you think of Battle Royale or movie violence, the way this story is peppered with horrible mass killings that keep happening over and over is utterly depressing.